Add enough cold water to cover the eggs, stir constantly with wooden spoon over high heat until water boils: this will centralise each yolk. Boil, uncovered until yolks are as soft or as firm as you like. Place saucepan of eggs under cold running water for about half a minute or until eggs are cool enough to handle. Crack shell gently and leave eggs immersed in cold water for at least 5 minutes or until cold. 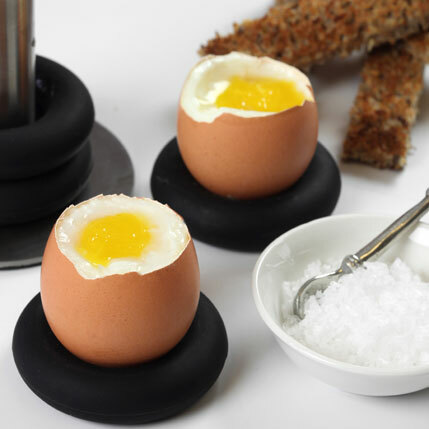 This will stop a dark ring forming around each yolk. Remove shells, starting from broad end. Pat the eggs dry before serving.